Padavi D. M. Professor, Dept. of Kayachikitsa, D. Y. Patil School of Ayurveda, Nerul, Navi Mumbai, Maharashtra, India. Makhijani B. N. Post Graduate Scholar, Dept. of Kayachikitsa, D. Y. Patil School of Ayurveda, Nerul, Navi Mumbai, Maharashtra, India. Vertigo is a disturbance of sense of equilibrium and movements, where person feels that either his surroundings are going around him, or he himself is rotating. It varies from mild imbalance to severe vertigo accompanied by nausea and vomiting. In Ayurveda it can be compared to Bhrama which manifests as consequence of aggravation of Vata and Pitta Doshas along with Raja Guna resulting in spinning of head. An open randomized clinical trial was conducted to evaluate the effect of Naradiya Laxmi Vilas Rasa and Goghruta Nasya in vertigo w.s.r to Bhrama for duration of 2 months. 100 patients were selected and clinical evaluation was done by subjective and objective parameters. It was noted that there was significant relief in symptoms of Vertigo. So, it can be concluded that Naradiya Laxmi Vilas Rasa and Goghruta Nasya has significant effect on Vertigo (Bhrama). M., Padavi D.; N., Makhijani B.. STUDY TO EVALUATE THE EFFECT OF NARADIYA LAXMIVILAS RASA AND GOGHRUTA NASYA IN VERTIGO (BHRAMA). 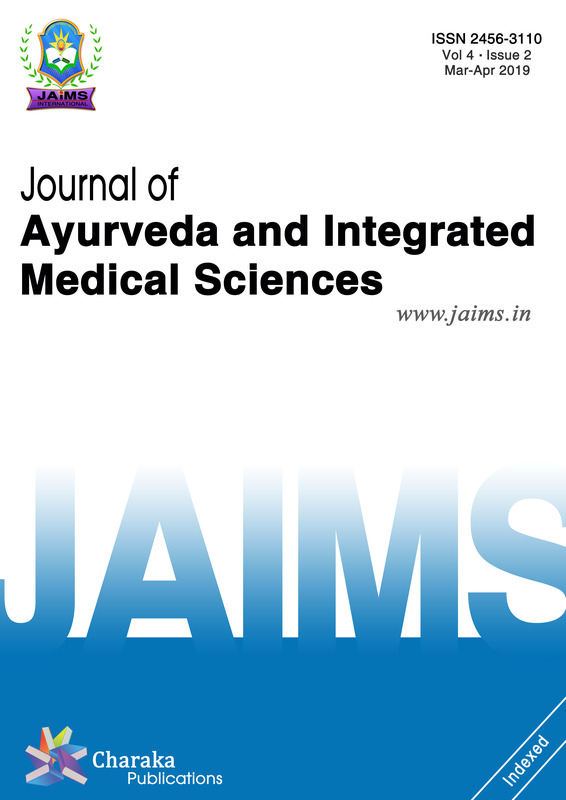 Journal of Ayurveda and Integrated Medical Sciences (ISSN 2456-3110), http://www.jaims.in/index.php/jaims/pages/view/Citation, v. 3, n. 5, p. 30 - 35, nov. 2018. ISSN 2456-3110. Available at: <https://jaims.in/index.php/jaims/article/view/678>. Date accessed: 25 apr. 2019. doi: https://doi.org/10.21760/jaims.v3i5.13816.